From what I've been told, IKEA is a magical land full of reasonably-priced furniture and unicorn turds. But guess what? Stupid IKEA isn't finishing up the store near (ish) me until fall of 2015. We made big changes to Gibson's bedroom, making it a Montessori-style room (more information about that >here<). 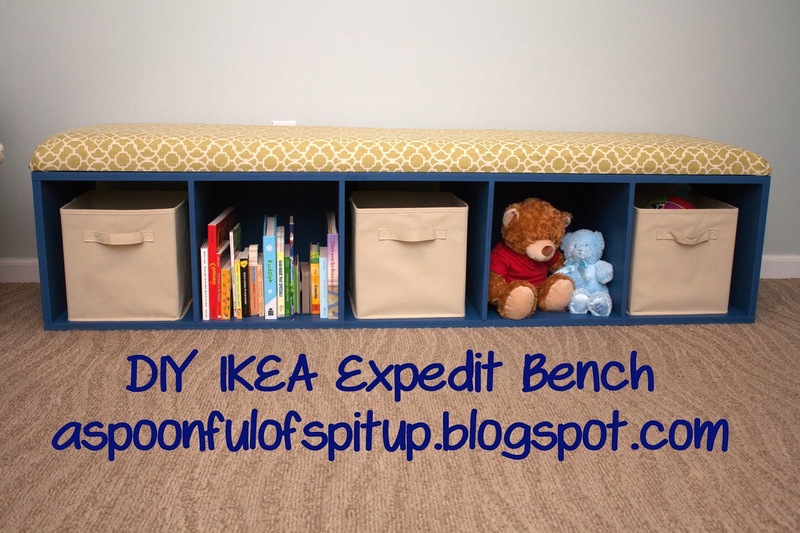 And I really wanted an IKEA Expedit bookshelf to use as a bench, because they're a good height for him to pull up and can't be pulled over. But since IKEA hates me, I decided that we would just make our own! Boo yah, IKEA! Just kidding, IKEA, we'll probably be best friends in a year and a half. So! I was looking for instructions/dimensions for making a shelf, and I couldn't find any. 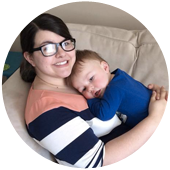 I figured that I would write about mine, which is slightly different from the Expedit, to help other people who want to make one! I'm so generous. And BONUS! I'll tell you all about making a cushion for the top! Because, as we established, I'm generous. Our shelf measures 70" long, 13.5" tall (without the cushion), and 18" deep. These dimensions are slightly different than the Expedit, but I just made it to work for us! We went to Lowe's to get MDF, and GUESS WHAT!? They cut it to size for us. The best! So you'll need the following pieces of wood/MDF/styrofoam. ...I really don't recommend you make this out of styrofoam. The sheets of MDF they have are 96"x48", I think, so we had some leftover. We used two pieces of the leftovers to help stabilize the back, but I can't tell you what size they are. You'll see photos later! We used 1 1/4" screws and a drill. I don't know the specifics...that was Danny's job. Here's how you put it together! The long piece goes on the outside of the short piece. If that makes sense. 2. Drill the other end of the long piece to the other 3/4" thick 18"x13.5" piece of MDF. Like the picture above shows. 3. We put the shelf dividers in at this point. Each opening is 13.3"x13.5", so we measured 13.3" from one short piece and put a 1/2" thick 18"x13.5" piece there. We then measured 13.3" from that shelf and put another piece, and did that until all four pieces were in place. We didn't drill them until we made sure that I had the measurements correct in my head. It looked like this! Once they were all in place, we started drilling on one side only. Before drilling, measure the opening to make sure it's correct! They didn't want to stay in place. 4. We then drilled the other side of the shelves onto the long piece. Again, make sure you measure the openings, because they get all wonky sometimes. 5. After the shelves were drilled into the long piece, we turned the entire thing over and placed the second 3/4" thick 70"x18" piece on top. 6. Start drilling again! We made sure to measure each opening again before drilling the shelf divider into the long piece. 7. Yay! You're almost finished! 8. Our shelf was slightly wiggly, so we took two random pieces and drilled them into the back to stabilize it. They don't look particularly pretty, but you can't even see them once it's up against the wall! See? Super weird. We were too lazy to cut them. But it's ok, really. 9. Next we sanded the edges to make sure there was nothing rough...it only took about five minutes. Thank goodness, because the sound of sanding is enough to make my hair stand on end. ...even thinking about it is making me crazy! Eek. 10. Paint that sucker! We decided on the navy blue that we had left over from the kitchen door. And we didn't want to drag the shelf into the cold garage, so we painted it in the kitchen! Boom! Painting in pajamas. The best way to do it. So now your shelf is finished! Ours took us around an hour to make...it would have been a lot longer if we had to cut the pieces ourselves! As far as cost goes, the MDF cost us around $60, and the screws were maybe $5. So it cost about the same as buying a pre-made shelf from IKEA, but the feeling you get when you build your own is priceless, right? Just kidding. If I had an IKEA nearby and wouldn't have had to pay shipping, I totally would have bought one. But that's ok.
And now for the cushion! Remember that 1/2" thick 70"x18" board we didn't use for the shelf itself? You'll be using it now! It turns out that foam padding for benches is expensive, and no one near me carries it. And I was too impatient to order it online and wait, so I used a mattress topper! I cut it in half (ish) and made it 3" thick. Here's where you learn about my building/sewing/crafting style. I like to fly by the seat of my pants. And I'm not super meticulous about things, usually. My bench is 18" wide, and a twin mattress topper is 34" wide. If you can do math, you will realize that if I doubled the mattress topper, it would only be 17". Ok, now for the numbered directions! 1. Lay your fabric on the floor, wrong side up. It helps projects go quickly when a dog and baby decide to be on your fabric! /sarcasm. 2. Lay your two layers of memory foam on the fabric so that you have several inches of fabric on each side of the foam. 3. Lay your board on top of the foam and line it all up. 4. Starting with a long side, pull the fabric taut and staple it to the backside of the board. Do this with all of the sides, leaving the corners for now. Make sure everything is nice and tight! 5. Finagle the corners until they look pretty much ok. And then staple it. Here's what mine looked like! After I did the corners, I cut off a lot of that extra fabric. 6. You're finished! Yay! We screwed this into the bench on the ends so Gibson can't move it, but you could also use velcro or just not attach it to the bench. It's up to you, ok? This bench is so ridiculously sturdy...I can't even pull it over (much less move it), and I weigh quite a bit more than Gibson (obviously). And with the cushion, it's really comfortable! We paid $25 for the memory foam, and already had the fabric, staple gun, and staples. As for the fabric baskets, we used the Closetmaid fabric drawers, which are $5.97 at Walmart and on Amazon. And we already had them, so FREE for us! Ha! You could probably find other baskets that would work, but I wanted something that Gibson could pull out and not hurt himself with. I hope those directions are clear! If you're confused at all, let me know and I'll try to elaborate...I'm really awful about just winging things and not being exact sometimes. But I think it turned out pretty well in the end! And my chunky boy likes it, too! He especially loves that outlet on the wall by it...thank goodness for outlet protectors! Do you like DIY projects? I know something else you can do yourself...click the lady at the top of this page! DO IT YOURSELF. Please. Thank you. Haha I didn't even notice that! But you're totally right...I'm obviously great at coordinating Gibson's bedroom with my blog. :) And thanks! This looks great! I'm going to do this for our playroom as soon as our budget catches up with the home improvements we've been doing during the past couple of months. Looking forward to it! I love the idea of using a mattress topper instead of legit bench foam. I'll have to see what's available in our tiny town. This would be great in a playroom! Someday I'll probably move ours to the basement where our playroom will be when Gibson is older. 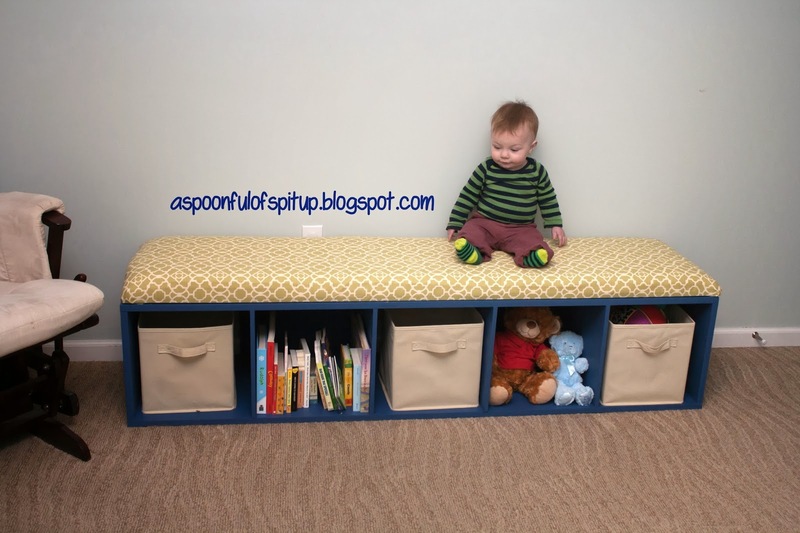 I saw on one blog that someone bought two of the shelves and made an L-shaped bench with them in a corner...it created so much storage!